Crush peppercorns and Salt together, finely chop the garlic, mix it all together in a small bowl (just larger than the steak) with some olive oil. Put the steak in it, and push it down, turn the steak and repeat until the steak is totally covered (add a little more olive oil if necessary). Put the shot of Vodka in the bowl over the steak add a little more oil so the steak is not quite covered. Cover bowl with glad wrap/cling film (or put it’s lid on if it’s tupperware).. put in the fridge.. 12 hours later give it a shake and put it back in the fridge.. The steak must be left for at least 24 hours. Heat a griddle or fry pan as hot as you can get it (do not put oil in it).. When hot put the steak in and wait 1 minute. Pour half the marinade on top of the steak.. Wait 2 minutes more, and flip the steak, wait one minute and add the rest of the marinade to the top. Cook to your preference by turning it over no more than once! Serve with chips and vegetables, or salad and put a splash of Worcester sauce in the gravy after serving…. NOTE: If you like your steak more than ‘medium’ don’t bother with this recipe as it won’t work. 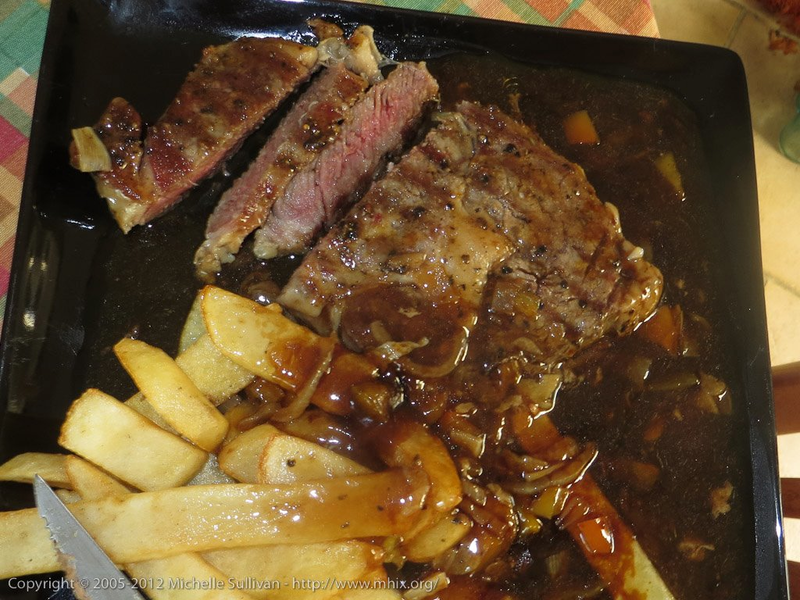 This recipe works best for those who like medium-rare steak!